A simulated 500-KT atomic bomb dropped at 1,770 meter above a city would generate damaging shock waves 30 psi at ground zero that decreases to 1 psi at a radius 14,162 meter. On February 15 at 3:20:26 UTC, a supersonic flying space rock, roughly the size of a van or a small truck, entered Earth’s atmosphere, exploded at 24,140 meters over Russia’s Chelyabinsk, and produced a total destructive blast power of 500 kilotons. This means the destructive power yield was 30 times the blast yield of the U.S. atomic bomb, named Little Boy, that was dropped on the Japanese city of Hiroshima in 1945. But what does that actually mean? Is the Russian meteor impact actually worse than the destruction of Hiroshima? As expected for a typical meteor, the Russian meteor burned up as it tore through Earth’s atmosphere, producing destructive blast waves and sonic booms. The energy was powerful enough to shatter countless windows, dishes, and televisions in people’s homes. The shock wave damaged about 3,000 residential buildings in the rural city and injured 1,200 people, Chelyabinsk city officials estimated. Most of the injuries were caused by shattering glass. At a zinc factory, part of the roof collapsed. However, that damage and injury from a 500-kiloton yield explosion is much less compared to the instantaneous mass destruction and indiscriminate mass slaughter that was caused by the heat ray, blast, and radiation of the 16-kiloton Hiroshima bomb. – In the video below, a dramatic reenactment of the explosion of the Hiroshima atomic bomb. 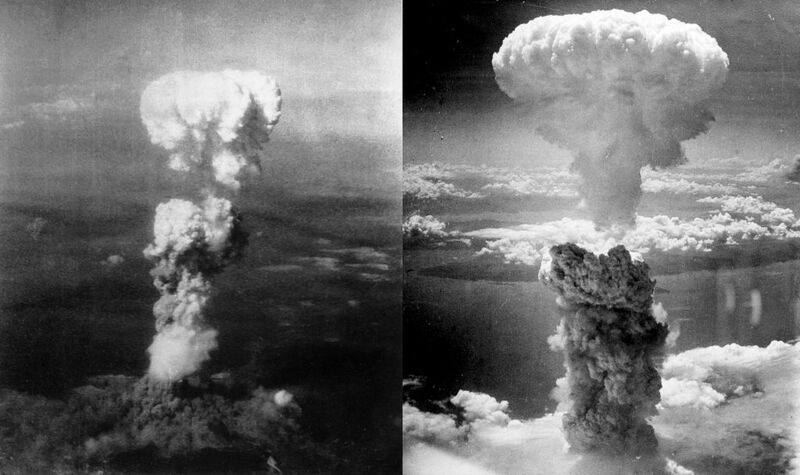 The explosion of an atomic bomb over Hirosima (left) and Nagasaki (right). – Credits: US Airforce. Compared to the atomic bomb that was detonated at 580 meters above Hiroshima, the Russian meteor disintegrated over Siberia at altitudes 40 times that of the Hiroshima detonation, but generated destructive power equivalent to 30 Hiroshima bombs. The fierce heat ray, powerful nuclear radiation, and tremendous blast from the Hiroshima detonation instantaneously destroyed 60,000 of 90,000 buildings, killed about 140,000 people, and injured more than 100,000 within a radius of 59,545 meters from the epicenter. Absence of powerful nuclear radiation in the meteor explosion means that thermal and sonic were the dominant energies. As with nuclear detonations, intensity of thermal energy, which generates blast energy as the rising temperature expands the surrounding air, plummets with decreasing altitude. Consequently, blast energy generated is reduced the further it travels. Furthermore, the meteor disintegrated multiple times, over a long distance, and at various altitudes. Therefore, the atmosphere largely protected the Earth this time, heating up the meteoroid and causing it to break apart. Luckily, “the atmosphere absorbed the vast majority of that energy,” said Amy Mainzer, a scientist at NASA’s Jet Propulsion Laboratory. – Below, the Russia Meteor shower sonic boom rocks Russian neighborhood. Ultimately, the destructive power yield from meteor explosions over Chelyabinsk on Friday exceeds that of the U.S. uranium-235 gun-type bomb that was dropped on the Japanese city of Hiroshima during the World War II but the bomb destroyed buildings, killed and injured humans to a much greater extent than did the meteor explosions. This is because about 15% of the energy in nuclear detonation is powerful nuclear radiation, causing immediate death and severe injury to human organs; this is absent in meteor explosions. Moreover, the Hiroshima bomb was detonated at a lower atmospheric altitude that had been tested and selected to maximize the bomb’s destructive power, but the meteor disintegrated spontaneously, at multiple times and at higher altitudes that rendered the destructive power less effective. If that 17-meter wide, 9-million kilogram meteor, 18 kilometers each second, were to wholly crash into the most populated U.S. city New York, the physical destruction and human catastrophe would be enormous. The blast waves and sonic boom could have instantly destroy roughly 9,000 of 13,000 buildings, killed and injured around 5 million of the 8 million people in New York City. That would be a natural disaster of epic proportion, and the Russian meteor event demonstrates that such a disaster is real and it could one day occur in any city on Earth. cool article from our resident nuclear/WMD guy !